Liam Reeve wins 3 T-shirts from our range for submitting this great holiday snap of himself wearing our ‘Overlook Hotel’ T-shirt at the Timberline Lodge Oregon, USA. Fans of Stanley Kubrik’s ‘The Shining’ will know that the external scenes of this building were used as the unforgettable ‘The Overlook Hotel’ in the film. 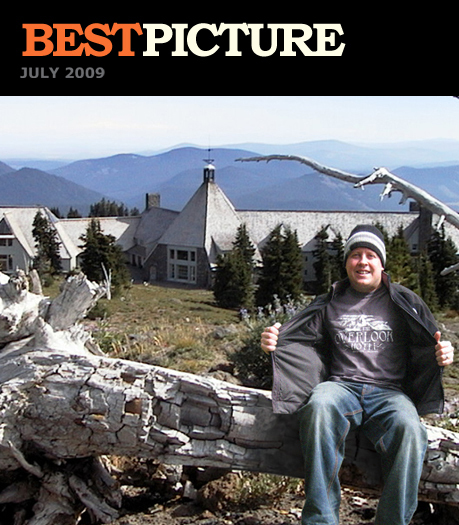 If you’re visiting any film locations or have any ideas you’d like to submit for our ‘Best Picture for August 09’ send them in to us at info@lastexittonowhere.com for a chance to win too. Click on the image to view all competition winners.